PinCarts is the individualized omni-channel shopping experience platform. Individualized targeting leads to a 78% of customer retention. Through the use of beacon technology, it will enable customers with multi-channel shopping options; store pickup, home delivery, and value-added in-store shopping. It delivers highly contextualized Analytical Insights to brands and retailers to help them make critical business decisions on time. It is available on smartphone as well web based platform. It is being set up to make shopping a more unique experience for each shopper with individualized offers, deals, and catalogs at the right time and location that compels them to visit a store at their nearest location and make the purchase. The beacon technology can accurately track where the shopper is and notify the retailer immediately. Pre-tracked details of the shopper, habits and brand preferences will enable the app to send individualized notification to the user and lure them to enter the store. The app is user friendly. Once a user signs up, it begins with the process of tracking the preferences, habits and brands of the user and sends an alert when a product of their choice is at a nearby location. It also sends push messages to the user without them having to do anything. In today’s competitive world, customer habits have changed. The app will facilitate the approach of retailers going to customers with their product. This tool will deliver integrated ways between digital and physical making business more effective and successful. Pincarts.com envisions that online retailers can’t wait for customers to come to them. Consumer shopping habits have changed; you have to take your product to them. Stores and brands that deliver easy integrated ways between digital and physical are the ones that are going to succeed, this means having technology that has these tools and solutions. 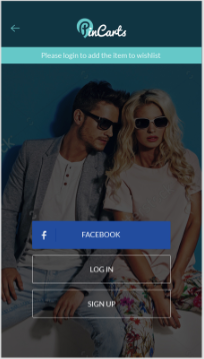 We at pincarts.com deliver the power of smart discovery of products using taste and preferences algorithm for consumers and a platform for retailers to take the physical world to these connected consumers via beacon technology. Retailers should look at adapting this untapped potential of beacon technology which will create a milestone in this competitive business world with India being one of the biggest users of smart phones. So here is all about Pincart. If you have any question or query do let us know in comment below. Thank you for reading.